Da Form 5519-R - What Is It? Da Form 5519-R, Tool Sign Out Log/Register is a form required for maintaining log procedures and controlling the inventory process. The form is used to keep a record of tool sets, kits, and outfits (further referred to as SKO) within the U.S. Army. When not issued for usage, all SKO should be stored in a tool room from where they are then issued. The tool room custodian is responsible for all SKO in the tool crib, but the person to whom the tool was issued takes personal responsibility for it. Only authorized personnel can sign for the tools they receive: the tool room custodian must maintain a list of staff authorized to receive tools and must check each person’s identity before issuing any tools or equipment to them. The DA Form 2062 issued on April 1986 is in use for 2018 - a fillable DA 2062 can be downloaded below. How to use Da Form 5519-R? A Key Control Officer or Key Control Custodian must prepare a separate log for each SKO on hand within one day or less. The log is prepared for the end item only, a log for each SKO within the end item is not required. The log is maintained via DA Form 5519-R. The basic information for each item listed on the form includes the National Stock Number (NSN), the written name of the tool, issued quantity, date of issue, initials of the tool room custodian, the name and signature of the person receiving the tool, and return date. The custodian must ensure that all tools are returned by checking the log at the end of each shift. All entries on DA Form 5519-R are entered in ink. The form is destroyed when all tools listed on the page are returned to the tool room. DA Form 2062, Hand Receipt/Annex Number is a listing of durable, non-expendable items assigned to servicemen or units in the US Army. 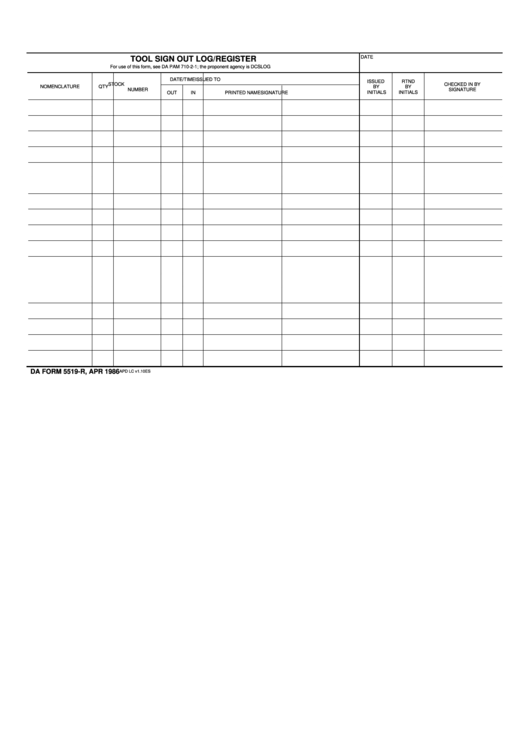 The form is used as a hand receipt with a Hand Receipt Annex Number, a hand receipt for quarters furniture and a hand or components receipt with Accounting Requirements Code (ARC). DA Form 5513, Key Control Register, is a form that is used to maintain a record of a Key Control Numbers in a certain Army unit or facility. The numbers used to fill the form could be any kind of identifying or serial number assigned to a certain item. Administrative registers should keep the filled and completed Key Control Register form for no less than 90 days. AA&E (Arms, Ammunition & Explosives) registers are to keep the form for a minimum of a year. The registers are to be disposed of after the above-mentioned storage time has expired. If DA Form 5513 is not currently in use, it should be kept in a locked container with restricted access.